Home Delhi Dynamos News What brand of football will Delhi play under Portugal? Miguel Angel Portugal was introduced to the press and the fans on Monday in a gala ceremony held in National Capital. Miguel has signed on a one year deal earlier this month after a groundbreaking technical partnership with Doha based Aspire Academy. Speaking to the media Miguel said "I saw a few of the Delhi Dynamos games on video and I was impressed with the player's attacking football. The club truly plays like a lion and it wasn't a difficult decision for me to sign up to play my part in shaping the club's future success." Upon being asked about the clubs decision of not retaining any domestic player the coach answered "I have been watching hours and hours of footage from I league and ISL games with our team and we are fully prepared for the draft"
After being questioned about the brand of football the fans will see Delhi Dynamos play this season, he said "We will play to win, we will need to have possession of the ball but that has to be smart and intelligent possession"
As Portugal was coaching Atletico Paraneance in 2014, the same club for which Gustavo Dos Santos played, it was only natural that we asked him if there was any chance of seeing the fans favorite magician back in the team this season. 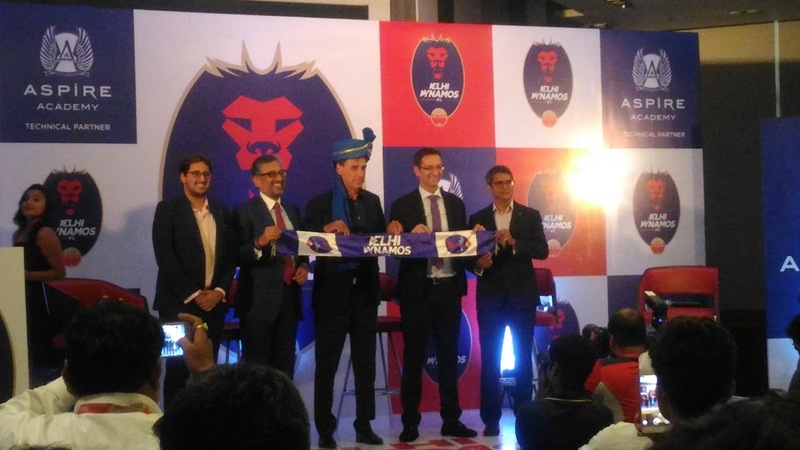 To this, he said "Yes, Gustavo Dos Santos, Bruno Pellisari, and Jonathan Luca played for the club but in the second team" he further added "They are good players, we are going to observe and then we will take a decision"
Talking about the new kit design, Mr Rohan Sharma, Director, Delhi Dynamos FC said "I am not from Delhi, I was born in America but the one thing Delhi and I both have in common is we like looking good, I was not happy with the kit design last year but this year I got personally involved with my staff to really design an awesome kit that not only fans but people who don't like football would also want to wear"
Miguel Angel Portugal is in Delhi for the domestic draft that is scheduled to happen in Mumbai on July 23, The coach and the whole administration seem confident about the draft. Keeping in mind that they will get two early picks, fans can rest assured that some good players will be signed.It was made clear that Delhi Dynamos are working day and night to build a strong squad and Miguel is carefully analyzing every player. Some news about foreign players can also be expected before the draft as Mr. Rohan Sharma himself hinted in a tweet. We just need to have faith and wait to see what future has in store for us, so till then let's Roar with the Lions.